Wayne, WV - During the week of June 6-12, Holy Cross Monastery, in collaboration with the new Eastern American Diocesan organization "Volunteers in Mission," hosted a week of volunteer labor and spiritual enrichment. Participants ranged in age from four to ninety-four, with a number of youth, young adults, clergy, and matushkas from the Eastern American Diocese. Mornings officially began with the reading of the morning prayers at the monastery’s guest house, but most of the pilgrims chose to rise earlier, before 5:00 AM, to join the monastics for the early prayer in the monastery church. During the day, the volunteers worked on various projects around the monastery grounds. In the evening, the group came together for dinner and spiritual discussions led by Archpriest John Moses, and on other evenings, the Vespers and Matins in the monastery church. Fr. John prepared three evening programs based on the theme "Living a Balanced Christian Life." These spiritually enriching discussions were filled with pertinent ideas, quotes from the Holy Fathers of the Church, and observations about living an Orthodox Christian life in the modern world. On Thursday evening, His Grace, Bishop George, joined the group for dinner, giving the participants an opportunity to interact with the monastery’s hierarch and abbot. He shared stories with the group about the beginning of his monastic life and a summer spent working at St. Herman of Alaska Monastery, where he met the late Hieromonk Seraphim Rose. The work week ended on Saturday with the Divine Liturgy, concelebrated by Archpriest John Moses, Priest Michael Furry (Bulgarian Orthodox Patriarchate), and Hieromonk Alexander (Frizzell), resident of Holy Cross Monastery. Bishop George, the monastics, and the volunteer pilgrims prayed in the nave. The work week participants were able to interact with members of the monastic community and acquire a fuller appreciation of the life of the monastics of the Holy Cross: how they pray for the Church and the world, how they work, and how they interact with one another as they carry out their monastic struggle in service to God and their fellow man. 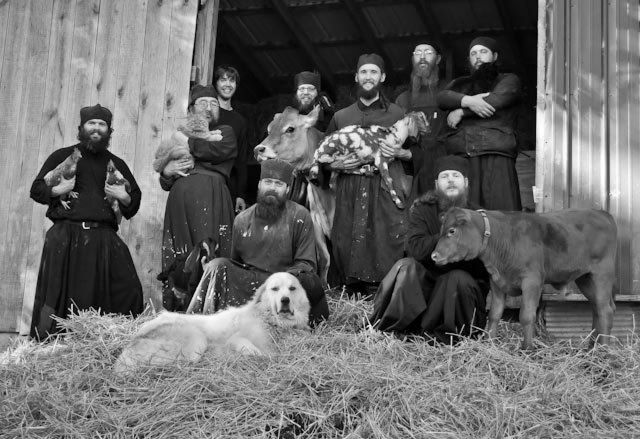 Holy Cross Monastery is grateful to the Fund for Assistance of the Russian Orthodox Church Abroad, Volunteers in Mission, and Archpriest John Moses, without whose help the work week would not have been possible. The goal of the work week was not simply to complete various tasks at the monastery, but to inspire the youth and young adults to go forward in their lives serving the Church, living a dedicated and pious Orthodox life, and to increase their appreciation for monasticism and volunteer service in missions. With God’s help, these goals were met, and the diocesan administration looks forward to future VIM projects that will both edify the participants and bless the recipients of their gifts of service.